Free online Lindenmayer system generator. Just enter the axiom and rewrite rules and you'll automatically get a visualization of the grammar. There are no ads, popups or nonsense, just an awesome L-system viewer. Press a button — visualize a Lindenmayer system. 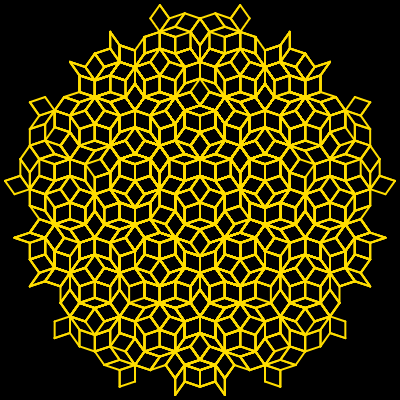 Created by mathematicians for mathematicians. Rule 1 Rewrite rule 1. Rule 2 Rewrite rule 2. Rule 3 Rewrite rule 3. Rule 4 Rewrite rule 4. Rule 5 Rewrite rule 5. Iterations How many iterations to perform? Select Direction Starting direction of movement. Line Width Thickness of a curve. Padding Padding around the image. L-system generator tool What is a l-system generator? This tool draws and visualizes L-system rules. The L-system is also known as the Lindenmayer system. It consists of an alphabet of symbols, a starting axiom and a set of rules that define how symbols get rewritten. With this tool you can specify which symbols to visualize, which symbols to skip, and how many iterations of rewriting to perform. 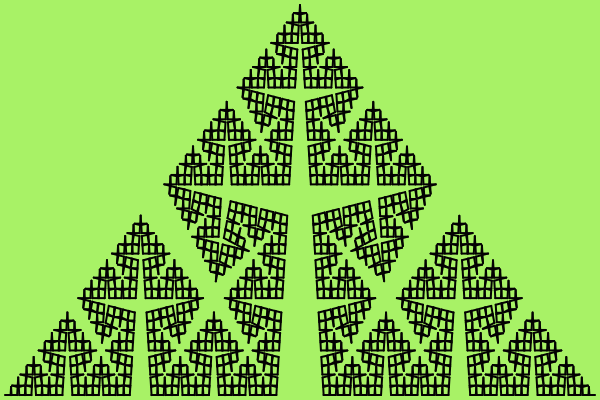 Because of the recursive nature of the rewrite system it often produces self-similar fractals. Symbols plus (+) and minus (-) have a special meaning and they change the curve direction by the specified angle. You can set the dimensions for your L-system and choose the drawing start direction. To make it more visually appealing, you can also set the color for the background and for the curve line, set the line thickness and padding. To share your creation you can click the link icon and get a URL to the L-system you created. Mathabulous! 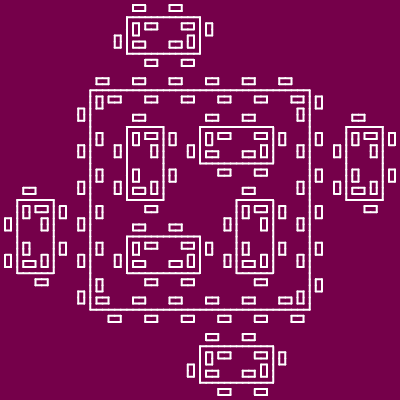 This example uses L-system rules to generate a fractal Gosper curve. It uses four iterations and angle of 60 degrees. Background is set to green and line width to 4px. 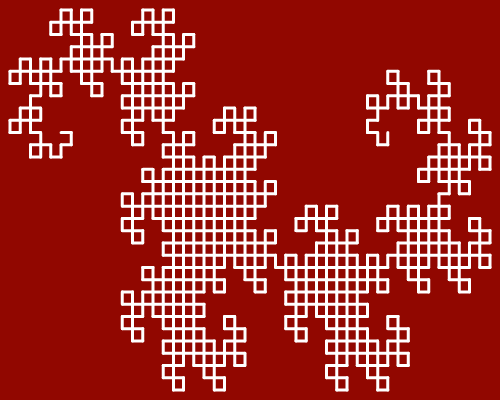 This example generates a 10th order dragon curve using simple L-system rewrite rules. We set background to red as dragons love to spit fire. 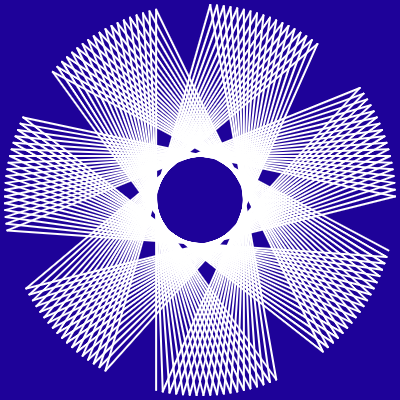 The L-system dimensions are set to 500x400px. In this example a curve similar to freezing ice pattern is created by a single Lindenmayer system rule. We used cold colors to make it look like a real frost. 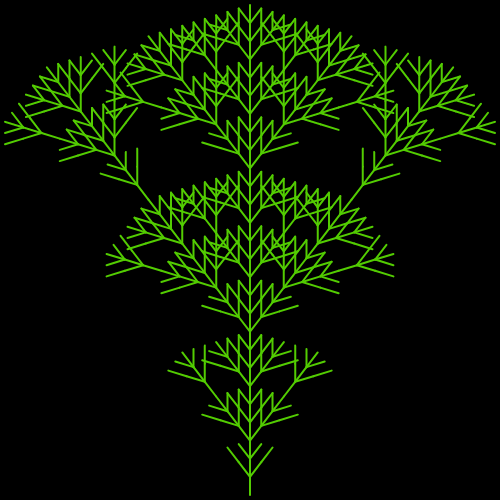 This example visualizes L-system rules that look like a tree. This curve has an angle of 36 degrees and is 3 iterations deep. We used special symbols [ and ] in the first rule that mean save the current curve position to stack, and restore the position from stack. This example generates a McWorter's Pentigree curve using just one L-system rewrite rule with a rotation angle of 72 degrees. It also sets iterations to 4, padding to 5px and width of curve's line to 2px. This example displays a non-standard L-system with an angle of 77 degrees. This curve consists of straight lines, which simultaneously form both a star and a circle. 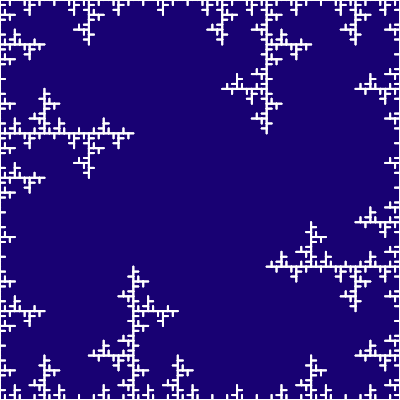 This example generates a L-system, which consists of many small rectangles that look like islands. There are two special restrictions here. The F symbol is used for drawing but the b symbol is skipped (if you remember that an L-system is just a turtle that walks around a canvas leaving a trace for every alphabet symbol, then the b symbol makes turtle move ahead without drawing a line segment). 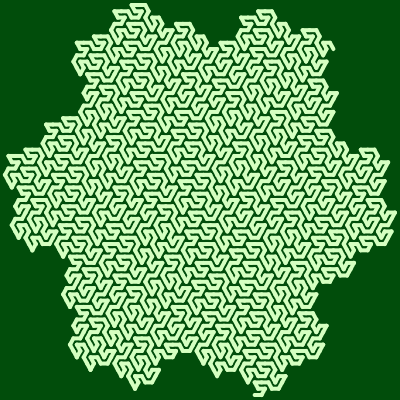 This example uses an L-system to generate a Penrose tiling. For this curve we use all 5 rules and use four characters for drawing. We also set the color of the background to black and yellow color for the line. Pretty! 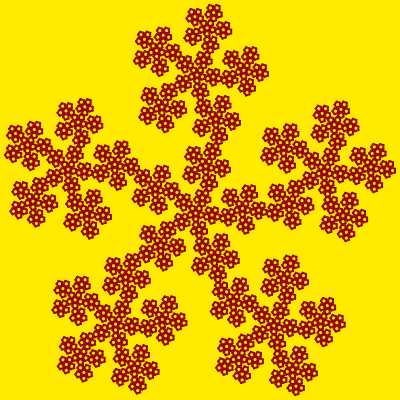 This example generates a variation of Koch star known as Cesero fractal with an angle of 80 degrees. It has a width of 600px and a height of 400px, it uses 6 iterations and the starting direction is set to left.